Hockey participation by youth and adults multiplied exponentially in states like Texas and Arizona upon the arrival of NHL teams. Officials in Seattle expect much the same with this week's awarding of an NHL franchise. Jamie Huscroft sounds more like a guy preparing for a tsunami or hurricane than the arrival of an NHL expansion team. Having played 10 seasons with seven NHL teams and now serving as director of facilities operations for the Eastside-based Sno-King Amateur Hockey Association, Huscroft, 51, knows what’s about to happen locally on the sport’s youth and recreational front. He’s seen it before in cities that land new NHL teams and says Seattle will undergo a transformation it has never before seen and isn’t close to being completely ready for. “You had Vegas going from 700 kids to 5,000 kids in a year or two,’’ Huscroft said of youth-participation levels. “That’s substantial growth that you would never see unless it was an NHL city. USA Hockey’s most recent membership report for the 2017-18 season counted 9,883 participants in this state, up 25 percent from five years ago. Sno-King, the region’s largest amateur hockey association, with more than 1,200 participants, operates two of only about a half-dozen indoor ice surfaces in the Greater Seattle area. The new NHL team will add three more ice surfaces for public use within city limits at a $70 million NHL practice facility at Northgate Mall, something Huscroft said will help accommodate the influx for now. In making that announcement, NHL Seattle CEO Tod Leiweke said one of the goals of the practice facility was to grow the game at the grass-roots level. 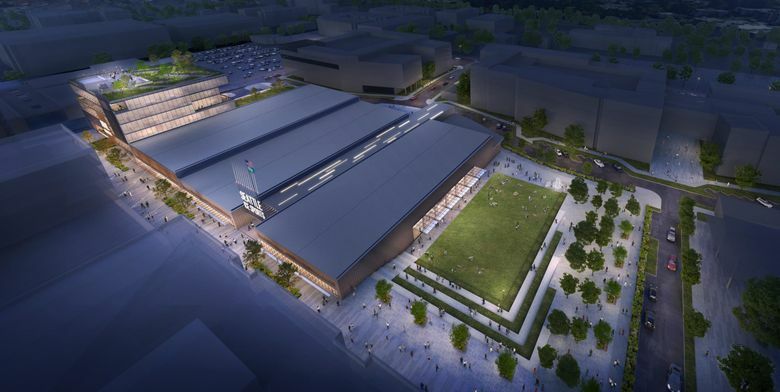 Huscroft agreed the facility will help get hockey newcomers on the ice quicker. Huscroft is excited to see the sport about to take off in Seattle like never before. Professional hockey dates back more than a century in Seattle, but we haven’t had a pro team since the minor-league Seattle Totems folded in 1975. And while Huscroft played major-junior hockey in the 1980s for the Seattle Breakers and Thunderbirds franchise, he said the exposure to fans on a mass scale just isn’t the same. “A lot of it’s just the media,’’ Huscroft said. “Right now, we just don’t get hockey news here in Seattle. There aren’t a lot of rinks around here, there’s no hockey news. So, you’re not going to put your kid into hockey as a parent if you don’t even know hockey exists around here. Kelly Goscinski, president of the Western Washington Female Hockey Association, the state’s only all-girls program for ages 4 to 19, also expects a major influx of registrations. There were 1,308 female hockey players registered in Washington as of this year — up 54 percent from five years ago. Fueling that growth is an explosive 137 percent increase since 2013 in girls aged 12-and-under playing the sport, now numbering 557 statewide. Former NHL and Thunderbirds player Turner Stevenson agrees. Stevenson coaches a 16-and-under “Jr. Tips’’ selects team for the WHL Everett Silvertips and has two sons playing for their 18-and-under and 15-and-under sides. He expects the NHL team to foster more elite players from this area. There were 5,932 registered USA Hockey players in Dallas when the Stars won the Cup in the 1998-99 season. Twenty years later, there are 15,026 players — nearly as many as the 15,222 in snowy Colorado. Of the nine Texas-born players in NHL history, eight of them came of age after the Stars’ relocation from Minnesota in 1993. That includes defenseman Seth Jones from Arlington, a fourth overall pick of the Nashville Predators in 2013 and now with the Columbus Blue Jackets in his sixth NHL season. When the Arizona Coyotes relocated to Phoenix in 1996, that state had 2,184 registered. Today, there are 8,617 players and the state’s handful of NHL graduates includes Scottsdale product Auston Matthews, drafted first overall by Toronto in 2016. Arizona also had only three ice surfaces when the Coyotes arrived. Today, there are 10. Stevenson expects that as youth hockey continues to grow, private investors here will build new rinks to keep up with the demand.